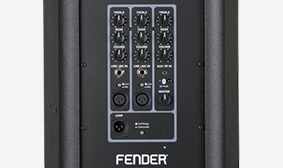 Experience incredible Fender® sound with this affordable, versatile and super-portable powered loudspeaker that's perfect for bands, solo performers, DJs, schools, houses of worship and businesses. The Fighter 12 is equipped with a 1100W Class "D" power amplifier that provides plenty of power for its high-quality 12" woofer and 1" titanium horn-loaded high-frequency compression driver. Dynamic limiting circuitry continuously monitors headroom and seamlessly adjusts system gain for distortion-free power even at higher volume levels. The Fighter 12 also includes onboard Bluetooth® audio streaming capabilities, making it easy to stream your favorite tracks before a performance or in-between sets. 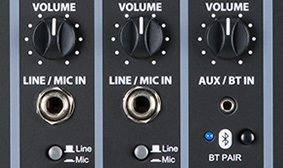 Its three input channels provide flexible connectivity for microphones or other audio equipment, and each channel features a two-band EQ to dial in your sound exactly the way you need for every performance. In an especially convenient and versatile touch, Fighter Series speakers feature high-fidelity Bluetooth connectivity for easy streaming of wireless audio from mobile devices. Fighter Series speakers are equipped with an onboard Class "D" power amplifier that boasts 1100W of clean, efficient power. Thanks to its dynamic limiting circuitry with continuous headroom monitoring, it delivers maximum power without distortion even at high volume levels. 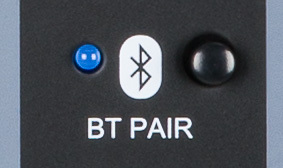 Fighter Series speakers include three flexible input channels to accommodate a variety of input sources. With XLR, 1/4" and 3.5mm connections, along with wireless Bluetooth connectivity, you can connect to almost any modern audio source with ease. Match your audio signal perfectly to the channel with volume and operating level controls, and easily dial in great tone with the two-band EQ on each channel.